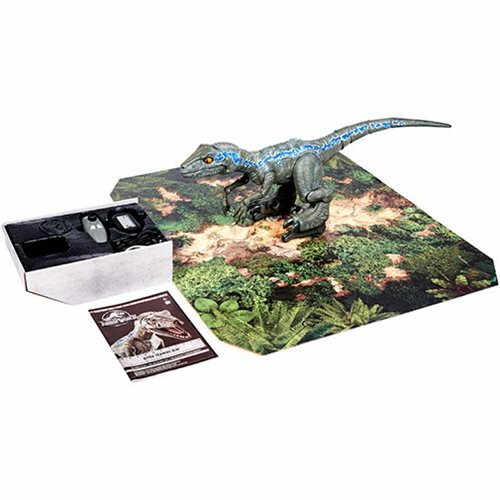 Train, control, and play with your own interactive, lifelike Velociraptor! Alpha Training Blue moves, blinks, roars, chomps, and responds to your commands! Use 4 different training modes for a fully immersive experience. Inspired by the Jurassic World: Fallen Kingdom movie. What's it like to train a dinosaur? 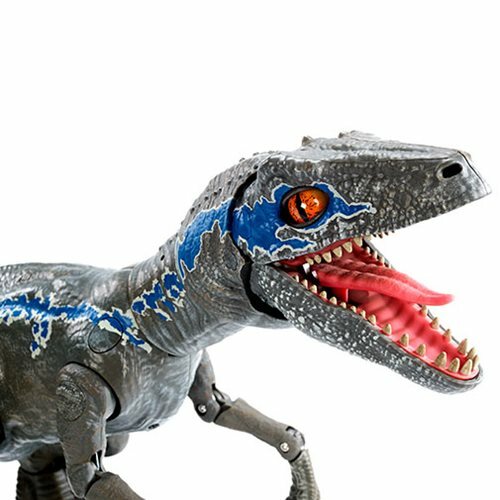 You'll find out with the amazing Jurassic World: Fallen Kingdom Alpha Training Blue from Mattel! Use the included remote controller (much like the clicker Owen uses) to train, control, and play with your responsive, lifelike Velociraptor. 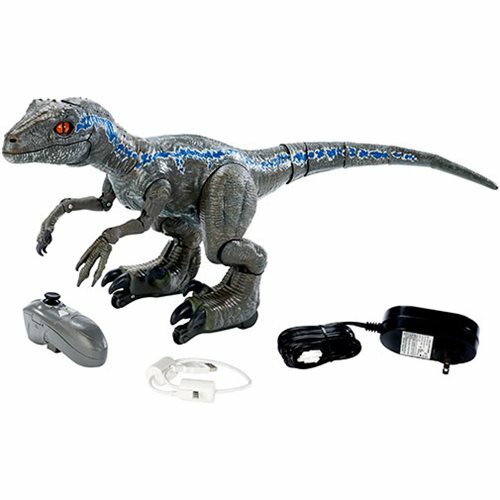 The fully interactive dinosaur has 4 modes of exciting play: Training Mode, Guard Mode, RC Mode, and Total Control Mode! Training Mode teaches you how to control your dinosaur using the accelerometer-based controller that allows Blue to mimic movements. Reward Blue by petting her, and move her using responsive motion commands. As you train, you'll unlock levels and her behavior will improve. Guard Mode enables you to set Blue in a location to monitor movement. If any "prey" gets within a foot of the motion sensors, the controller will vibrate. You can then issue appropriate commands to warn the intruders. RC Mode uses the joystick portion of the controller to move the dinosaur around. You can control Blue to move her forward, backward, and side to side! In Total Control Mode, you control Blue's movements, from her eyes and mouth to her head. With incredibly lifelike motion, Alpha Training Blue moves, blinks, roars, chomps, and responds to your commands for a truly immersive interactive experience!